I seek to serve you & Midland in a level of government closest to you. I value the wisdom of elders, dreams of youth, hopes of business owners and understand concerns of families. Midland is my families home and yours, with your guidance we together can make policies and decisions to stand behind. I enjoy interacting with and learning from people in various sectors & communities. Together, respecting and learning from our past we can design a future worthy of passing on. For our town to be accessible, safe & an inclusive healthy community in all stages/circumstances in life. Where our diversity and rich culture, assets, Midland Bay Landing and services are a source of pride, a draw for tourists and businesses. A town that trust its elects, has sustainable growth, excellent financial management practices, suitable infrastructure, is ecologically responsible, is a role model in communications, outreach, urban design, job retention and environmental practices. Fair Taxation & Fiscal Management– manage costs effectively; without compromising efficiency and service levels- infrastructure and capital expense projects; managed critically – forecasting and planning for future needs. 2014 platform. Health Care. I attended Queens Park with SOS GBGH supporters. I authoured the paper presented to the minister of health. I became a PFC advisor (community advocate) on two committees (LHIN & HQOntario). Midlands Accessibility Advisory Committee, 2nd Term. 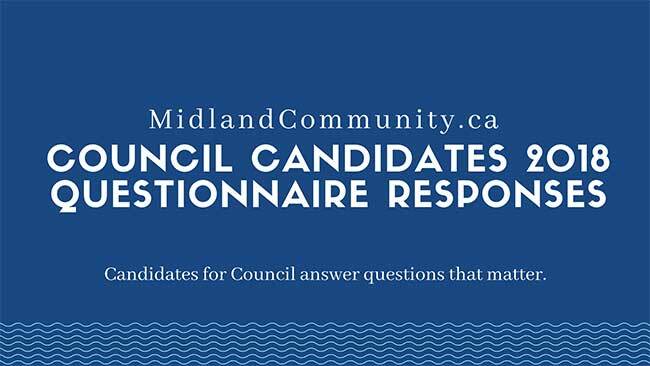 Be the first to comment on "2018 Council Candidate Questionnaire Response – Carole McGinn Nichols"